Christopher R. O'Hara is a trial lawyer and a partner at Todd & Weld. He joined the firm in 1993 in the first year of the Firm's existence and has over 30 years of civil trial experience. Mr. O'Hara is a member of the firm's employment litigation and complex commercial litigation groups. Mr. O'Hara represents companies and individuals in a wide range of employment law and business disputes, including bet-the-company cases. In the employment practice area, he advises companies in a variety of employment decisions from hiring to terminations, counseling on investigations, employment guides, wage and hour issues, independent contractor classification issues, company handbooks/guides, policies and agreements, and matters concerning state and federal employment law. Mr. O'Hara has successfully represented employers and employees in numerous industries in defending claims of all types of discrimination, including sexual harassment, age, race, national origin, gender and handicap/disability discrimination, as well as retaliation claims before the Massachusetts Commission Against Discrimination (MCAD) and the Equal Employment Opportunity Commission (EEOC). Mr. O'Hara has been involved in several qui tam/whistleblower cases. He frequently represents senior executives in the negotiation of their employment agreements and severance agreements in numerous industries. Mr. O'Hara's practice also includes labor law advising, and representing businesses in disciplinary/discharge hearings and AAA arbitrations. Mr. O'Hara has litigated over 100 noncompetition and non-solicitation decisions in the Business Litigation Session in Massachusetts and in other state and federal courts. He has represented executives and companies in over 100 separation agreements in numerous industries, including, biopharmaceutical/life sciences, financial, information technology, banking, higher education, and insurance. He has been featured in Massachusetts Lawyers Weekly articles, and is a frequent speaker at continuing legal education on the development of employment law, including non-compete agreements, and separation/severance agreements. 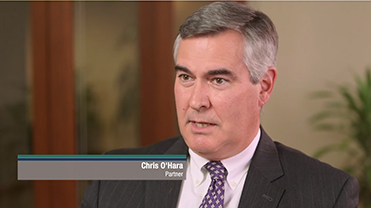 Mr. O'Hara has tried many complex commercial disputes, including shareholder disputes, business torts, trade secrets, Lanham Act issues, and corporate governance matters in closely held corporations. He has represented lawyers in disputes involving attorneys' fees, and defended lawyers in legal malpractice actions. He has extensive experience representing businesses and individuals in investigations by state and federal authorities, including the U.S. Securities Exchange Commission, FINRA, the Attorney General, the U.S. Department of Justice, the U.S. Department of Labor, and OSHA. Mr. O'Hara represents various health care professionals, including physicians before the Massachusetts Board of Registration in Medicine, and other health care professionals before the Massachusetts Office of Professional Licensure. Christopher R. O'Hara is Panelist at MCLE Seminar Entitled "Obtaining or Defending Summary Judgment in Employment Cases"
Christopher R. O'Hara of Todd & Weld LLP a Panelist at Seminar: "Business Litigation Session 2005"